Rubicon Days: Trick or Treat Giveaway: Roll Out the Red Carpet with Ruby! 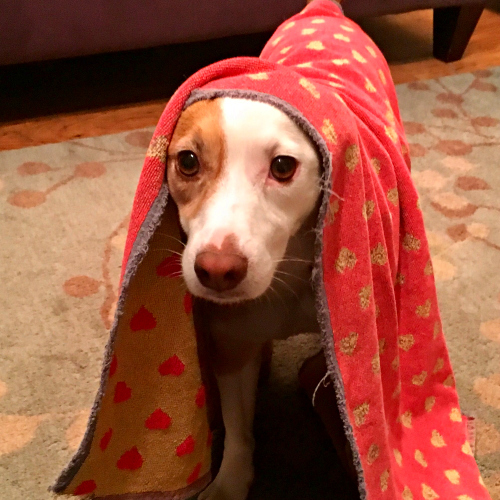 Ruby has been learning several new tricks lately with a towel prop so I decided to work on "roll out the carpet." This is a great trick for food-motivated dogs that incorporates some problem solving in the early stages. 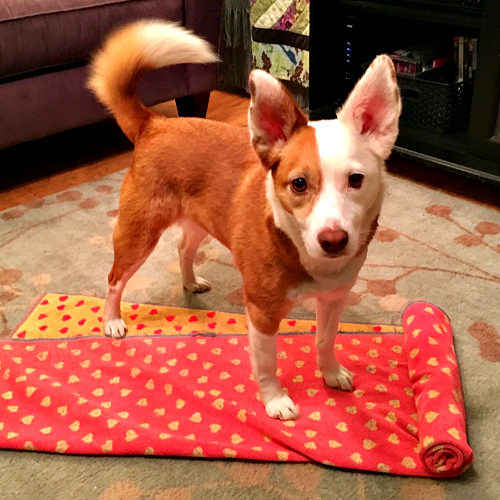 After rolling up a number of small treats in the towel or carpet, let your dog sniff them out and unroll the carpet with their nose. After they get the hang of pushing the carpet, try it without the hidden treats and mark/reward the unrolling. Add the cue once your dog is consistently unrolling the carpet. Are you ready to go trick-or-treating? 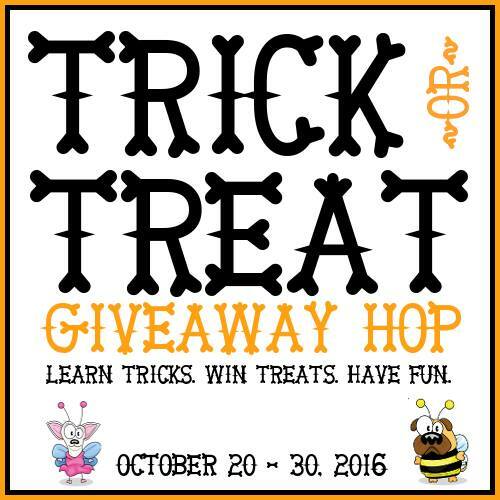 Enter the giveaway below, then visit the following blogs for more chances to win and to learn more tricks! Kol's Notes, Beagles & Bargains, My Dog Likes, A Dog Walks into a Bar, Wag 'N Woof Pets, Dog Mom Days, Heart Like a Dog, My GBGV Life, ChiPets, Fidose of Reality, It's Dog or Nothing, Sarcastic Dog, The Broke Dog, Tails from the Road. Trick or Treat Giveaway Hop - Rubicon Days BONUS: Follow all of our trickster treathounds on Instagram for a chance to win a social media prize: a $20 PetSmart gift card and a custom bowtie from Brooklyn Bowtied! Happy hopping! Aw what a great trick! My dog can't do this one yet. Definitely going to try this trick with Teddy! Thanks Lara and Ruby! Yup! My dog Jasper Zen knows this and 100 more tricks! We love Jasper Zen! Thanks so much for stopping by! My pups don't know this one yet. That's a cute trick! We are getting so many fun ideas! Will definitely be giving this one a try! nope we don't know this but it's something we can try! Bella and Terra did this trick at the Trick Dog workshop we attended :) I don't think Kronos has tried this one yet. Great job Ruby! Cool! My dog is not there yet. we don't know this one! so cute! We don't know this one yet. This is adorable I will have to teach my pup this too! I had never even thought about this as a possible trick but I love it so much! Mr. N is used to targeting so I pointed at the mat and he started pawing at it and I shaped it. I haven't tried this trick yet. Good idea though! Ruby is too cute and performed the trick so well. Nala and Cody don't know this trick and a I can totally see Nala just shaking the towel. An enrichment activity turned trick. HOW AWESOME!!!!!!!!!!!! What a fun trick! I want to work on this one tonight! Our malamute doesn't know this trick. Your dog is very smart! My dog could never earn this. I think he is just too stubborn and it is too complex for him. Awesome trick.. she can sort of do this trick. What a cute trick. My dogs don't know this, but it would be cute for them to. Hmm, my dogs doesn't know this one yet. Will have to work on it this weekend! He does not know this trick, his only tricks are sit, shake and get your pillow. My dog does not know this treat. this is an adorable trick. would love to teach this to my pooch. Nah, my dog doesn't know it. and I don't think it's really all that useful for him to know anyways.. Mom Kim here - Lady Shasta does know a few tricks (roll over, crawl, learning to pray, sit up or beg-on command only) but not this yet - will have to add this one. She is VERY treat motivated. Rolly knows no tricks. He is my dumb dumb friend. I’m entering to win the gift card for my sister, who is a cat lady! I’m not sure her cats know any tricks, beyond driving her crazy. Cute Trick! Coco doesn't know this one! But I do like this one! No, my dogs know very few tricks. We really should work on that. I find it hard to try to train 3 dogs at once and they are always together. My dog doesn't know any tricks. I've tried to teach her several times in the past but she just doesn't get it. This is a really cute trick - and Ruby looks adorable doing it! What a fun, easy trick to teach. Great for parties and graduations where the graduate walks down the carpet behind the dog! My dog does not know this trick but I plan to teach it to him. My dog does not know the trick. No. My Pekapoo would just steal the towel. Cute! I will have to try this with Barley, but my guess is that she will just pick up the towel and shake it until the treats fall out. My dog doesn't know this but I'm gonna try now! My dogs do not know very many tricks at all. I will have to try teaching them this one. That last photo is so cute! This looks like a really fun trick, and I'm definitely going to try this one with Luke. I think I might even be able to get our beagle Cricket interested in this one. She's not big into tricks, but she would definitely enjoy finding the treats. Plus our house is full of rugs to roll now because of her arthritis, so we have lots to work with! No, she doesn't know how do this trick, but I think this is one I could teach her. I have 3 dogs but had not seen this done before will have to try it out. No our dogs don't do this I'd like to try to teach them. Yes my dogs can do this if they smell food. oh my ,adorable !! No, YoYo does not know that trick. no my girls cant do this, but they sure know how to tear up a bed and make their own. very cute. My dog doesn't know this trick, but is so serious it would be easy to learn. No, my dog doesn't know that trick. Would come in handy though. Thanks for sharing. This is really adorable!! I have never tried this trick with my dog but it looks like fun! Thanks! It looks cool. I like it. My dog would probably look at me like I was bonkers. No Bo can sit and shake. He loves to stand up and hug you. Great trick! None of my dogs can do this. THAT's adorable! I think it's something even Sampson with his physical limits can do, and I can see this being something we work on on those really bad weather days when we can't walk. They don't know this, but it really looks like they would have fun with it! No, my dog doesn't know this trick. He would probably just try to eat the carpet if it had food in it! How adorable! No, my little gal does not know how to do this. My dog doesn’t know this trick. I have a 4 year old Boxer, & she’s really hyper and gets excited easily.. so sometimes she has difficulty trying to pay attention long enough to learn tricks lol. I've never seen this trick before, but I am trying to teach her to wife her feet on a rug. I have not seen this trick before. My dog does not know it yet. No dog. I'd love the gc and any treats, etc would go to my local shelter. I think this is a clever trick! None of my dogs know this, but I think it might be a good thing to teach them - especially my Kyoko. Kyoko was nearly starved before I adopted her and she still eats like she's starving, so anything that would get her to slow down with treats would be good. Cute trick! I haven't seen this one before. This would be a gift for my friends dogs to share. They know many tricks! My dog does't know this trick just the basic tricks. No, my dog doesn't know this trick. My dog is working on this trick. She's a timid rescue but smart and wants to do well.